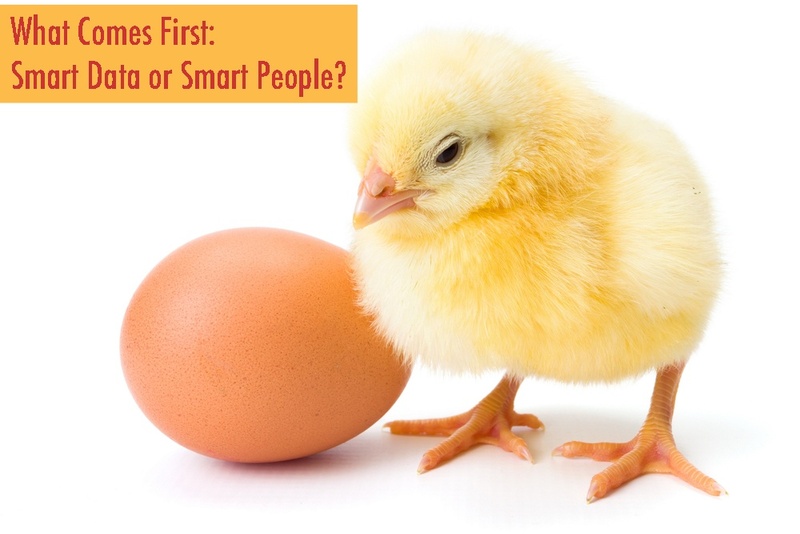 What Comes First: Smart Data or Smart People? Determining the reason why two restaurant reporting numbers are different can be a real challenge, like the chicken or the egg. In this era of big data, many restaurant companies are racing to improve their use and comprehension of the data they have locked up in their system silos. But, the question for this post is: Does data make people smarter or is it the other way around? 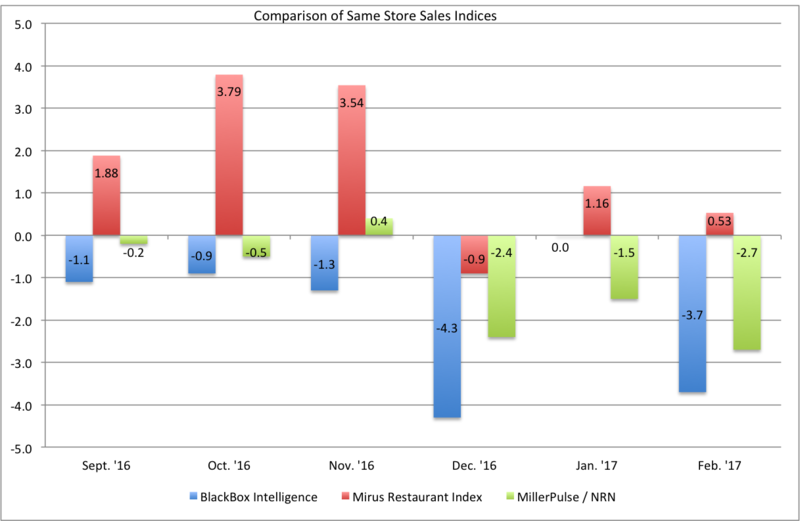 In 2017, same-store sales of all restaurants fell by -1.1% according to TD2NK and their Black Box Intelligence index. This index is computed on data from 30,000 restaurants, so it is a pretty good aggregation of data - about 5% of the restaurant industry. In this population, I think it is fair to say that some of the companies use their data aggressively and some do not. December continues to look like an important month for the restaurant industry. After years of poor or lackluster results overall, the first half of December has delivered positive same store sales and traffic, according to the Mirus Index. Much has been written over the past two years about the dismal pattern of same store sales and traffic for restaurants. Traffic has been negative throughout this period, and sales have rarely been positive, and then only when restaurants increase prices. Our clients love us and we love them right back! We're constantly amazed by their ingenuity and accomplishments. Their ideas and requests are what keep us on the leading edge of restaurant business solutions. Periodically we like to shine the light on our clients, their accomplishments and what they're doing to increase their restaurant profit margin. The official numbers for July are now out and it was a bad month for restaurants sales, down by -4.7% according to TD2NK. I thought it would be good to take a mid-month check on the Mirus Index to see if August could be the month to turn things around. Based on the first 14 days of the month, the sales slump continues in August. 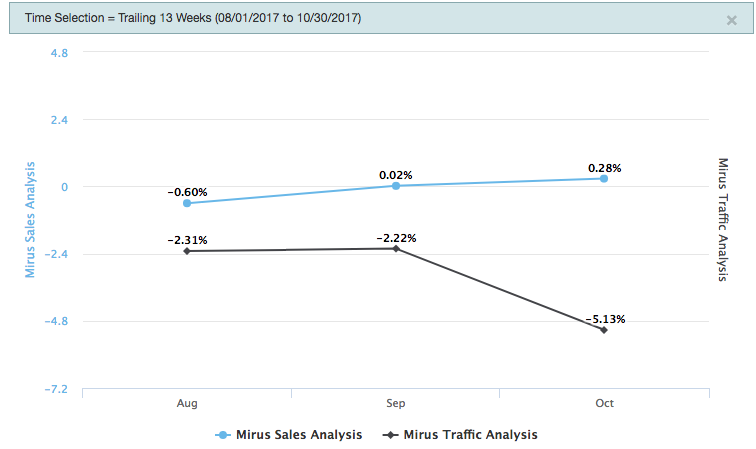 Same Store Sales in Mirus Index were positive in both Q1 and Q2 of 2017, and you can see the trail end of that in the chart above. The positive gains were declining in June, and July 4th was a great weekend, but by the middle of July the month to date numbers were negative and they haven't budged much. 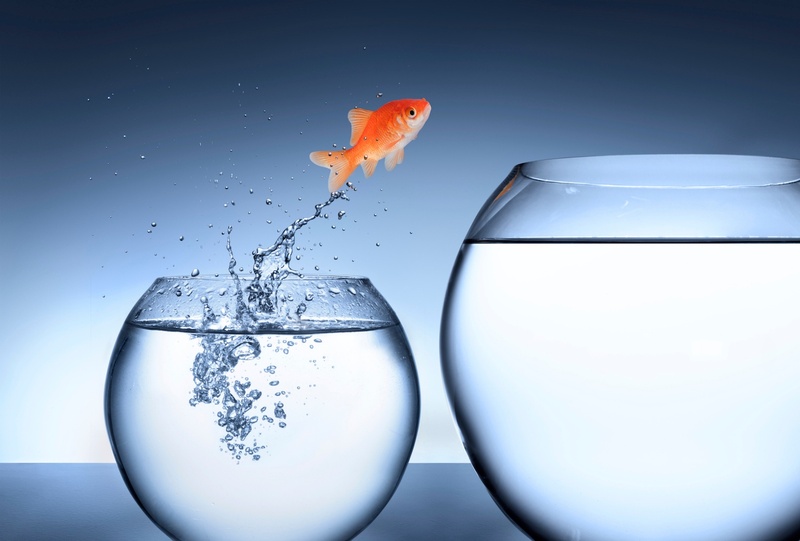 All of this is focused on sales, but what about traffic? Q3 will be the seventh quarter in a row of negative customer traffic into restaurants. TD2NK measures that traffic fell -8.7% from July 2015 to July 2017. 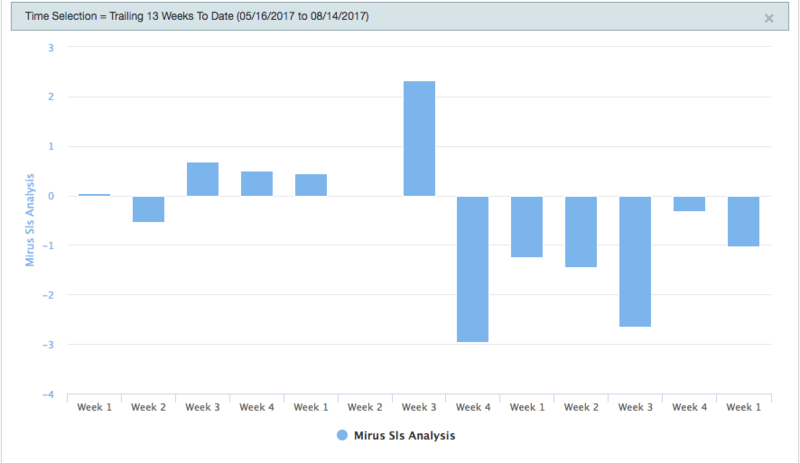 The Mirus Index has traffic down -2.7% at the mid-way point of Q3 2017. You can manipulate same store sales, but you can't manipulate customer traffic. We will keep an eye on things, and keep you informed. If you would like to learn more about how you can get the Mirus Index every day, click on the button below. Restaurant sales and customer traffic have been in decline for months, and July didn't help. While the results were not the worst in recent history, July extends several streaks that started at the start of 2016. Same store sales for July fell (1.2%) on (2.6%) less traffic. July was the first month this year that recorded negative growth in both numbers. All restaurants, big or small, depend on a Point of Sale (POS) system to keep track of their business financials. A POS system can generate reports based on sales and customer information and trends that allow the restaurant operators to examine sales data along different thresholds and create promotions based on popular items or slower day parts. POS systems provide useful information to executives as their restaurant business develops. Measuring success or failure of a system that improves decision making is challenging in many respects. But, the Same Store Sales (SSS) metric can be useful, especially when applied to a long period of time, and across thousands of restaurants. SSS is caluclated as a percentage change from last year to this year, and only uses locations that are open for both years. Restaurant Growth is Optional. Change is Inevitable. Choose Wisely. Spreadsheets are one of the most popular tools used to organize data and manage restaurants. Why? Because when you’re starting out spreadsheets are manageable, cost effective and contain useful tools for manipulating data. Over the past several years however, I’ve seen some pretty incredible spreadsheet usage leaving me dumbstruck by the amount of copying, pasting, calculating and linking of pages that, in turn, create massive multi-page workbooks not to mention the hours of work that goes into their care and feeding. And as a report consumer, if you can locate the information you need in one of these behemoths, it’s likely the information is out of date before you even received it.